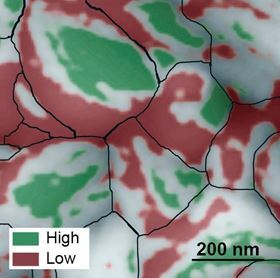 This atomic force microscopy image shows the grainy surface of a perovskite solar cell: individual grains are outlined in black, low-performing facets are red and high-performing facets are green. Image: Berkeley Lab. Scientists from the US Department of Energy's Lawrence Berkeley National Laboratory (Berkeley Lab) have discovered a previously unknown facet of perovskite solar cells hidden within their crystalline structure that could dramatically boost their efficiency. Solar cells made from compounds that have the crystal structure of the mineral perovskite have captured scientists' imaginations. They're inexpensive and easy to fabricate, like organic solar cells. Even more intriguingly, the efficiency with which perovskite solar cells convert light to electricity has increased more rapidly than any other material to date, starting at 3% in 2009 – when researchers first began exploring the material's photovoltaic capabilities – to 22% today. This is in the ballpark of the efficiency of silicon solar cells. Now, as reported in Nature Energy, a team of scientists from the Molecular Foundry and the Joint Center for Artificial Photosynthesis, both at Berkeley Lab, have uncovered a surprising characteristic of perovskite solar cells that could be exploited for even higher efficiencies, possibly up to 31%. Using photoconductive atomic force microscopy, the scientists mapped two properties that relate to photovoltaic efficiency over the active layer of the solar cell. The resultant maps revealed a bumpy surface composed of grains about 200nm in length, and each grain has multi-angled facets like the faces of a gemstone. Unexpectedly, the scientists discovered a huge difference in energy conversion efficiency between different facets on individual grains. They found poorly performing facets adjacent to highly efficient facets, with some facets approaching the material's theoretical energy conversion limit of 31%. The scientists say these top-performing facets could hold the secret to highly efficient solar cells, although more research is needed. "If the material can be synthesized so that only very efficient facets develop, then we could see a big jump in the efficiency of perovskite solar cells, possibly approaching 31%," says Sibel Leblebici, a postdoctoral researcher at the Molecular Foundry. Leblebici works in the lab of Alexander Weber-Bargioni, who is a corresponding author of the paper that describes this research. Ian Sharp, also a corresponding author, is a Berkeley Lab scientist at the Joint Center for Artificial Photosynthesis. Other Berkeley Lab scientists who contributed include Linn Leppert, Francesca Toma and Jeff Neaton, the director of the Molecular Foundry. This research began when Leblebici was searching for a new project. "I thought perovskites are the most exciting thing in solar right now, and I really wanted to see how they work at the nanoscale, which has not been widely studied," she says. She didn't have to go far to find the material. For the past two years, scientists at the nearby Joint Center for Artificial Photosynthesis have been making thin films of perovskite-based compounds, and studying their ability to convert sunlight and CO2 into useful chemicals such as fuel. Switching gears, these scientists started working with Leblebici on creating pervoskite solar cells composed of methylammonium lead iodide and analyzing the cells' performance at the macroscale. The scientists also made a second set of half cells that lacked an electrode layer and packed eight of these cells on a thin film measuring 1cm2. They then analyzed these films at the Molecular Foundry, mapping the cells' surface topography at a resolution of 10nm. They also mapped two properties that relate to the cells' photovoltaic efficiency: photocurrent generation and open-circuit voltage. They did this using a state-of-the-art atomic force microscopy technique that utilizes a conductive tip to scan the material's surface. This technique eliminates friction between the tip and the sample, which is important because the perovskite material is so rough and soft that friction can damage both the tip and sample, and cause artifacts in the photocurrent. The maps produced by this technique revealed an order of magnitude difference in photocurrent generation, and a 0.6-volt difference in open-circuit voltage, between different facets on the same grain. In addition, facets with high photocurrent generation had high open-circuit voltage, and facets with low photocurrent generation had low-open circuit voltage. "This was a big surprise. It shows, for the first time, that perovskite solar cells exhibit facet-dependent photovoltaic efficiency," says Weber-Bargioni. "These results open the door to exploring new ways to control the development of the material's facets to dramatically increase efficiency," adds Toma. In practice, the facets behave like billions of tiny solar cells, all connected in parallel. As the scientists discovered, some cells operate extremely well and others very poorly. In this scenario, the current flows towards the bad cells, lowering the overall performance of the material. But if the material can be optimized so that only highly-efficient facets interface with the electrode, then the losses incurred by the poor facets would be eliminated. "This means, at the macroscale, the material could possibly approach its theoretical energy conversion limit of 31%," says Sharp. A theoretical model describing the experimental results also predicts that these facets should influence the emission of light when perovskite crystals are used in light-emitting diodes (LEDs). This story is adapted from material from Lawrence Berkeley National Laboratory, with editorial changes made by Materials Today. The views expressed in this article do not necessarily represent those of Elsevier. Link to original source. Scientists have discovered that the degradation of perovskite solar cells in sunlight is reduced at low temperatures and reversed in the dark. Treating hybrid halide perovskite solar cells with a solution of methyl ammonium bromide can repair defects in the perovskite film. By capturing both high- and low-energy photons, a new perovskite tandem solar cell has achieved a power conversion efficiency of 20.3%.